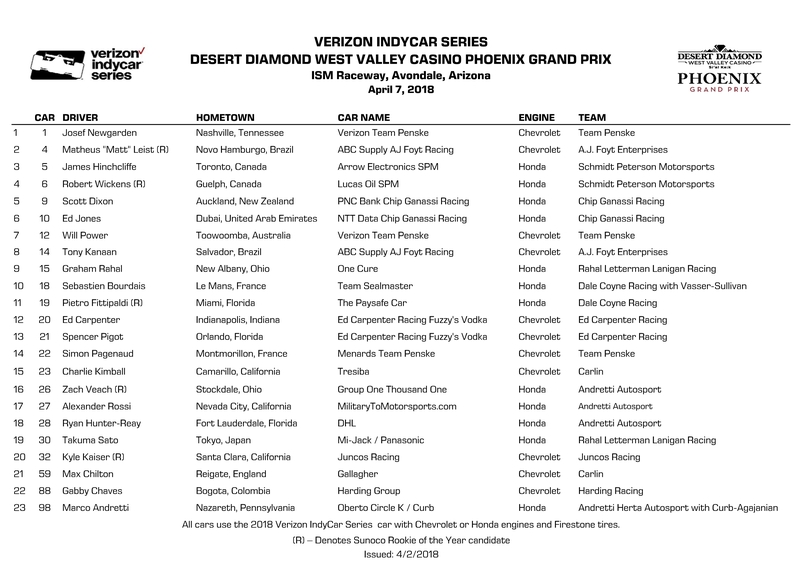 Leigh Diffey will be the play-by-play announcer for NBCSN‘s telecast of the Desert Diamond West Valley Casino Phoenix Grand Prix alongside analysts Townsend Bell and Paul Tracy. Marty Snider, Kevin Lee, Katie Hargitt and Robin Miller are the pit reporters. Radio Broadcasts: The Advance Auto Parts INDYCAR Radio Network is led by chief announcer Mark Jaynes, with analyst Anders Krohn. Turn reporter is Jake Query with Nick Yeoman and Michael Young reporting from the pits. All Verizon IndyCar Series races are broadcast live on the Advance Auto Parts INDYCAR Radio Network, Sirius 214, XM 209, IndyCar.com, IndyCarRadio.com and on the INDYCAR Mobile app. Verizon IndyCar Series qualifying is broadcast on Sirius 214, XM 209, IndyCar.com, IndyCarRadio.com and the INDYCAR Mobile app and Verizon IndyCar Series practices are broadcasted on IndyCar.com, IndyCarRadio.com, and the INDYCAR Mobile app. 6:35 p.m. – Desert Diamond West Valley Casino Phoenix Grand Prix (250 laps/255.50 miles), NBCSN (Live). * Sebastien Bourdais claimed the season-opening race of the Verizon IndyCar Series for the second year in a row as he won the Firestone Grand Prix of St. Petersburg on March 11. Bourdais is hoping to claim back-to-back wins to start the season for the first time since 2006 as he pursues a fifth Indy car championship. * Josef Newgarden of Team Penske continues defense of his 2017 Verizon IndyCar Series championship. Newgarden captured his first series title in his first season with Penske, winning 4 times. Now aims to be Team Penske’s first repeat champion since Gil de Ferran collected back-to-back CART championships in 2000 & 2001. * Scott Dixon hopes to add to his record-setting resume in 2018. Dixon’s four season championships tie him with Indy car greats Mario Andretti, Sebastien Bourdais and Dario Franchitti, trailing only the seven titles collected by A.J. Foyt. Dixon is fourth on the all-time Indy car victory list with 41 and won at ISM Raceway in 2016. 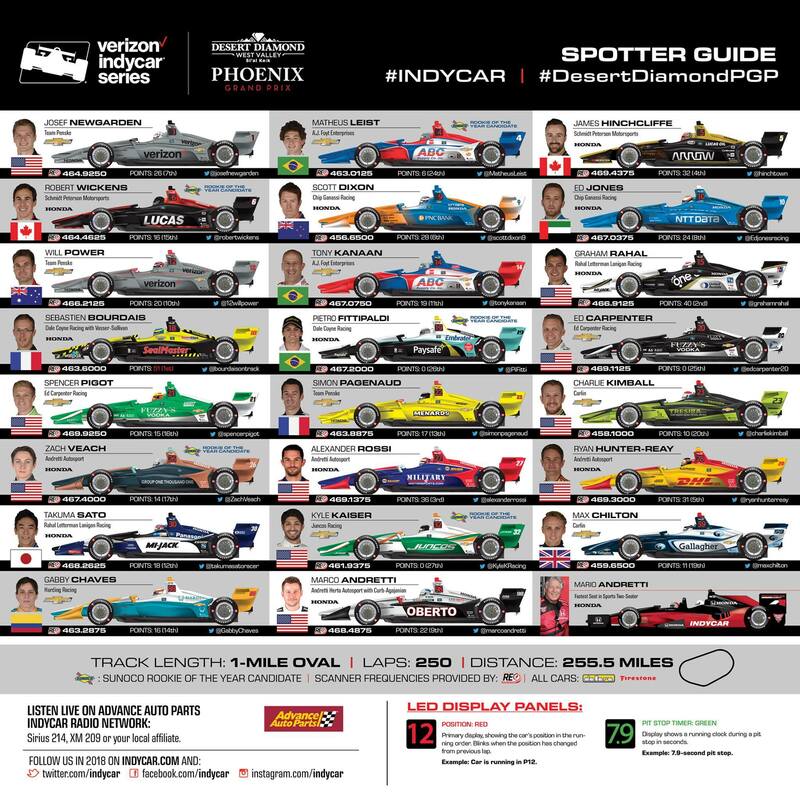 * The Desert Diamond West Valley Casino Phoenix Grand Prix will be the 64th Indy car race at ISM Raceway since the track opened as Phoenix International Raceway in 1964. Al Unser has the most wins by an Indy car driver at the track (six). Tony Kanaan (2003 and 2004), Scott Dixon (2016) and Simon Pagenaud (2017) are the past Phoenix winners entered in this year’s race. * ISM Raceway hosts the first of 6 oval races on the 2018 IndyCar Series schedule. Other oval events scheduled are: 102nd Running of the Indianapolis 500 presented by PennGrade Motor Oil (May 27), DXC Technology 600 at Texas Motor Speedway (June 9), Iowa Corn 300 at Iowa Speedway (July 8), ABC Supply 500 at Pocono Raceway (Aug. 19) and Bommarito Automotive Group 500 presented by Valvoline at Gateway Motorsports Park (Aug. 25). * Twelve drivers have won the Phoenix race from the pole: Mario Andretti (1966), Lloyd Ruby (1967), Bobby Unser (1968, 1972), Al Unser (1969, 1985), Gordon Johncock (1973), Johnny Rutherford (1977), Rick Mears (1982, 1989, 1990), Teo Fabi (1983), Tom Sneva (1984), Arie Luyendyk (1996), Helio Castroneves (2002) & Tony Kanaan (2003). * Drivers who have won at Phoenix have gone on to win the Indy car championship 9 times: A.J. Foyt (1964, 1975), Mario Andretti (1966), Bobby Unser (1968), Al Unser (1970, 1985), Rick Mears (1982), Bobby Rahal (1992), Buddy Lazier (2000), Sam Hornish Jr. (2001) and Tony Kanaan (2004). * Matheus “Matt” Leist, Robert Wickens, Pietro Fittipaldi and Kyle Kaiser will each make their first Indy car oval start this weekend at ISM Raceway. Fittipaldi, the grandson of two-time Indianapolis 500 winner Emerson Fittipaldi, and Kaiser, the 2017 Indy Lights champion, will each be making his series debut in Phoenix. The four drivers – along with Zach Veach – are all Sunoco Rookie of the Year contenders. * Tony Kanaan seeks to start his 284th consecutive race this weekend, which would extend his Indy car record streak that began in June 2001 at Portland. Kanaan will attempt to make his 345th Indy car start, which would pass Helio Castroneves for third on the all-time list. * Scott Dixon has made 225 consecutive starts heading into this weekend, the second-longest streak in Indy car racing. Andretti Autosport’s Marco Andretti has made 201 consecutive starts, which is the fourth-longest streak in Indy car racing.